This tweet was my response to an Australian Broadcast Corporation story on social credit. One of the people I felt was belittled by the piece was Liu Hu, a Chinese journalist who has been put through the ringer of China’s media controls more than once for his whistleblowing investigative journalism. Fortunately, Liu Hu is a wonderful and prolific writer, and you can still read his story in his own words online. Modest and candid in his writing, he carefully and clearly explains his current situation and how he got there. I don’t know what ‘lost his social credit’ means, but criminal defamation charges made in 2013 were ultimately dropped and did not give him any kind of ‘low score’ that ‘locked him out of society’. Following the decision not to prosecute, the Global Times, an aggressive state-run newspaper, even wrote an article praising his work. While totally unrelated to social credit, what these charges actually brought upon Mr. Liu was awful. He was held in custody a full year for criminal defamation before the police were required to release him on guarantee in order to continue their investigation. It wasn’t until another full year after his release that the prosecution dropped the case entirely, entitling him to compensation for his time in detention. In a detailed interview, now translated into English, he describes the unacceptable conditions of his confinement. He faced 70 interrogation sessions in the course of that single year, some lasting over 10 hours, using exhaustion and extreme temperatures to get him to confess. He never did. In 2015, Hu was sued for defamation over microblog posts and the blogging platforms were also named as defendants. Unlike the proceedings discussed above, this was a civil suit not related to any criminal charges. After losing at trial and on appeal, Mr. Liu was ordered to give a formal apology, pay 8,000 RMB (about US $1,100, reduced from the demanded 20,000 RMB) and an additional 1,000 RMB in court fees. As for the apology, the court ordered that within 10 days of the judgment taking effect, Mr. Liu needed to put an apology on the front page of his microblog accounts for 7 continuous days.The court was to review the content of the apology, and if Mr. Liu did not perform in the time provided, then at the request of the plaintiff the court would select a periodical with nationwide circulation in which to publish the main content of the judgment at his expense. Mr. Liu did not like the idea of being forced to put an apology on his own homepage, so after learning from contacts that a similar publication in another high-profile defamation case had cost about 500 RMB, he chose to wait and pay. As for the monetary damages, he transferred them in February 2017, and sent a copy of the receipt as a message to the enforcement division judge’s cell phone. In May 2017, Mr. Liu discovered he was on the court’s judgment defaulter list when he tried to book a plane ticket and was denied. This list is not a ‘pilot social credit scheme’ but a fully implemented judicial enforcement system that has impacted 11 million people. It is not for the ‘dishonest’ but for people who have the capacity to act on a court judgment but refuse to do so. Liu Hu was not on the list because of his refusal to apologise, but because the court never received the 9,000 RMB monetary award. On inspection, he found that he had sent it to the wrong account and it had been returned to him. He immediately sent it again, and sent additional interest payments two days later. The judgment defaulter list is an example of the main mechanism of the social credit system. A number of governmental agencies in key fields such as food safety, travel, and the courts, were tasked with creating blacklist systems (and warning lists called ‘key scrutiny lists’) for certain legal violations under their authority. These industry-specific blacklists are published on a central platform but not really integrated into a single score or measure of any kind. If you appear on three different warning lists, you do get integrated into a “big-data warning list”, but that’s about it at this point. The consequences of these industry-specific blacklists are also largely industry-specific, such as increased frequency of inspections after a food safety incident at a factory. The court judgment defaulter list is the broadest reaching of these joint punishment MOUs, and includes limits on air travel and other ‘high-spending’. Perform on the judgment and you get off the list, assuming the bureaucracy works in a timely and effective manner. Unfortunately, even after Liu Hu had paid the award, he remained on the list. This time, the problem was his refusal to make the apology. The enforcement judge demanded he make the apology. Liu Hu pointed out that they were well past the time limits for the apology as indicated in the judgment, and that the consequence was publication at his expense, an expense he was willing to pay. 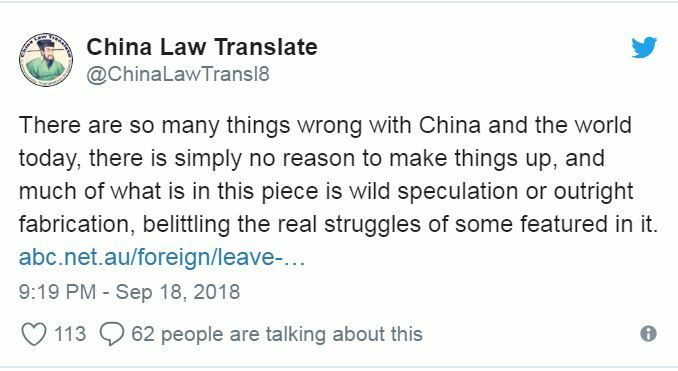 In June, he went so far as to take the initiative and transfer an additional 600 RMB to the court to cover publication costs, saying ‘if there’s extra return it, if it’s short I’ll add more”. He remained on the list. Throughout this period, he sought redress through several channels, talking to the judge, making an official complaint that the judge was exceeding the original judgment by continuing to demand an apology, and making an objection that he had already performed and should be removed from the defaulter list. Nothing worked. After Liu Hu published his first article about being on the list and generated some attention, the judge contacted him again with the costs of publication in two nationwide periodicals and asking Liu to pick one: the first would cost 32,000 the other 7,000, both well above the 600 RMB Liu Hu had anticipated. He still hasn’t paid or apologized, and remains on the judgment defaulter blacklist. It’s an awful situation. Saying that it is “due to his low score”, a score ABC suggests can be based on consumer purchases or medical records, is wrong and insulting. It is due to a principled stance that Liu Hu has chosen to take, even though he knows all too well what punishment in China can look like. Mr. Liu knows what detention looks like. China puts people in house arrest, sometimes in houses other than their own under ‘residential surveillance in a designated location’. Mr. Liu is not under ‘effective house arrest’. As he says, he cannot purchase plane tickets or high-speed rail tickets. He cannot even buy the most comfortable bunk in China’s older trains. Those are the limits on his mobility. Cars, buses, or slower trains can all take him out of Chongqing. If someone thinks this is still just as unacceptable a limitation on liberty, I don’t necessarily disagree. But as I said in the tweet at the start of this post- things are bad enough, why make things up? Giving credit “Map” of the 2014-2020 Social Credit Plan Who did China ban from flying? The redlists are coming! The blacklists are coming! What are your sources for this story? Did you check the complainants’ stories with the police or the Procurate? Why did you write it? To tell us about a miscarriage of justice–in a country where 95% of citizens trust their justice system? Has it occurred to you that the US executes 2,000 people annually, without trial, and imprisons 2,000,000–also without trial? That less than one-third of Americans trust their justice system for this reason? Your job is to explain China to us, not to do investigative journalism there. Do that in Australia, where it IS your job. Excellent, balanced analysis. Well written too. The estimated value for a full translation of this post is $368.70 USD at the below-market rate of $.06 per character, with 5,495 characters.